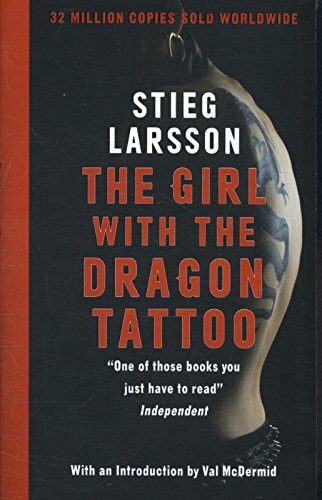 "The Girl with the Dragon Tattoo" by Stieg Larsson is a sensational thrilling and a complex crime novel that deals largely with a murder mystery, financial fraud, sexual abuse of women and the darker aspects of the life of the privileged echelon in the society. What is better than sinking into a cosy blanket with an interesting novel on cold wintry days? Well, I believe nothing like that! I finished reading this interesting novel, 'The Girl with the Dragon Tattoo'. By the name of it, I was under an impression that some magic and occult practices might be involved in the story. But, I was wrong. This is the first novel in the author's 'Millennium Trilogy' series. Stieg Larsson was a Swedish Journalist and one of the world's leading experts on anti-democratic, right-wing extremist and Nazi Organisations. He had died unexpectedly in 2004 soon after delivering the manuscripts for three crime novels - The Millennium Trilogy to his publisher. All of them have been posthumous best sellers and have been made into movies. The novel story has roughly 3 plots of story entwining intricately and culminating into a spelling binding saga. The story starts with the octogenarian industrialist - Henrik Vanger, head of Vanger Corporation - currently run by his great-nephew Martin Vanger, receiving a frame of pressed flowers on his 82nd birthday. It had been a ritual receiving them for the past 40 years on his birthday. He had received it from his granddaughter 'Harriet' for the first time. The later year Harriet had disappeared mysteriously without a trace and all the following years he had received the frame of pressed flowers from some anonymous sender. It intrigued him and tormented him. He had spent his life trying to discover what had happened to Harriet and was obsessed with it. He believed someone in the family had murdered her. In the second plot, journalist Mikael Blomkvist, a partner in the publishing firm, 'Millennium' loses a libel case against Billionaire Industrialist, Hans Erik Wennerstrom. Mikael is sentenced to 3 months jail and fined with a huge penalty. Faced with a prison sentence and a professional disgrace he chooses to take a break in his career and decides to resign from the magazines' board. His decision is met with resistance from his other partner-Erika Berger, his longtime friend, confidant and occasional lover. Dismissing all disapproval, he stands by his own decision which he thinks is good for him and for the magazine's survival. The third plot is about, Lisbeth Salander- the girl with the dragon tattoo, who is a security specialist at Milton Security. She is an ingenious hacker and uses her skills in her assignments at Milton Security. She has a disturbed past and that has followed her all her life. She is introvert, has a bad temper and keeps her life largely to herself. She is given the assignment to dig into Mikael Blomvist's life by Vanger's longtime friend and faithful lawyer, Frode. Mikael is summoned by Vanger to his house in Hedeby. Very inquisitively, he visits him and is offered a rather unusual assignment. Vanger asks him to officially write a book on Vanger family but his real assignment would be to dig into Harriet's case and possibly find out what happened to her in a year time. He promised him a huge financial reward and a solid evidence against Wennerstorm that would help him fight back in the court. Mikael agrees to do the task. Mikael delves deep into the Vanger's past to uncover the truth behind Harriet's disappearance. He begins analyzing the information compiled by Henrik Vanger for over 40 years. He carries both real and official assignments simultaneously. The Vanger family is one large family with lots of relations and Mikael also finds it hard to remember who is who for the first few days. After months of futile hard work, Mikael makes some advancement and finally sees a ray of hope. At this stage, he requires a research assistant to help him. Frode suggests Salander's name and eventually, she is involved in the investigation. They make some serious progress in the investigation to find out that there is someone who does not want the past to be revealed. Facing all deterrence, they continue to find out one of the darkest secrets of the Vanger family and the mystery into Harriet's disappearance in a very dramatic way. Finally, he cracks Harriet's mystery only to find out that Henrik's promise of a solid evidence against Wennerstorm had been mostly a bluff to lure him take this assignment. On top of that Henrik requests him not to publish the dark secrets of his family, he has come to know out of Harriet's case investigation. As a journalist, he is in a great dilemma and gives in to it. Lisbeth comes up with the idea of helping with evidence against Wennerstorm and together they work out a plan to expose Wennerstorm and save Millennium from collapsing. The story in the novel after Harriet's case breakthrough becomes monotonous. The author in his childhood had been a witness of child abuse and sexual assault and that has a lot of influence on the storyline. The story offers a very ugly view of human nature and in particular how Swedish men treat Swedish women. The actual title of this novel in Swedish was' Men who hate women', which to me seems apter rather than this one. Most of the part of the novel had been about Harriet and the title does not seem to do justice to the content of the story. The character of Mikael also seems to fall for any woman in its way. Maybe the writer is trying to portray another Swedish man. Overall, the story begins on an exciting and high note, carries it to a considerable length and then suddenly falters a bit. None the less, it is an interesting novel with a gripping plot and deeply intriguing and varied characters. If crime fiction is a genre you enjoy, this should definitely on your to-read list. Want to grab a copy, you can buy it here. I have also read the next two books in the Millenium Trilogy series. You can check out their review in the links below. Hi Jyothi..nice review.. I have been dying to read this trilogy for a long time now.. Right now I am into eat pray love.. Will try to read after that..